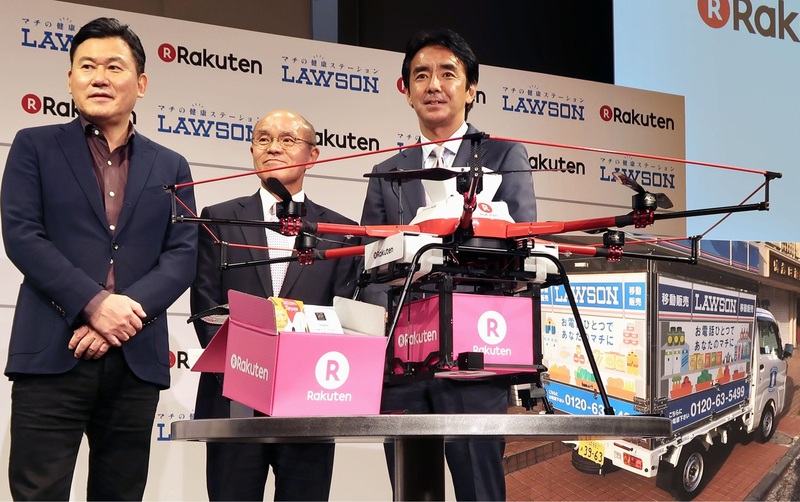 Convenience store chain Lawson Inc. and Japanese cybermall operator Rakuten have announced plans for a demonstration test on Oct. 31 of drone delivery services in an area devastated by the March 2011 earthquake, tsunami and ensuing nuclear disaster in Fukushima Prefecture. 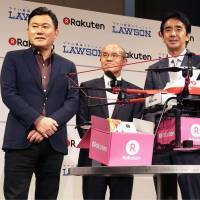 The test will be conducted in the Odaka district in the city of Minamisoma, Fukushima Prefecture, utilizing an outlet, a mobile Lawson shop and Rakuten’s drone. When the traveling shop visits an area some 2.7 km from the convenience store in the district, it will take orders from locals. The drone will then deliver products, including warm cooked food, from the outlet to the moving shop. The service will be available only on Thursdays during the test run over a period of six months. The drone can carry up to 2 kg of products and deliver them in about seven minutes. The central government lifted its evacuation order for Minamisoma in July last year after it was imposed in the wake of the triple meltdown at Tokyo Electric Power Co. Holdings Inc.’s wrecked Fukushima No. 1 nuclear plant. Although residents have begun returning to their homes, there are few places to buy food and daily necessities. Lawson President Sadanobu Takemasu said he hopes the service will play a valuable role in the community, where a number of older people have difficulty visiting stores.